Today, we celebrate the Real Presence of Jesus Christ in the Eucharist. Which is a hard teaching to really comprehend… even many of Jesus’s disciples questioned it in the famous Bread of Life discourse that occurs in the Gospel of John! 12 On the first day of the Feast of Unleavened Bread, when they sacrificed the Passover lamb, his disciples said to him, “Where do you want us to go and prepare for you to eat the Passover?” 13He sent two of his disciples and said to them, “Go into the city and a man will meet you, carrying a jar of water. Follow him. 14Wherever he enters, say to the master of the house, ‘The Teacher says, “Where is my guest room where I may eat the Passover with my disciples?”’ 15Then he will show you a large upper room furnished and ready. Make the preparations for us there.” 16The disciples then went off, entered the city, and found it just as he had told them; and they prepared the Passover.22 While they were eating, he took bread, said the blessing, broke it, and gave it to them, and said, “Take it; this is my body.” 23Then he took a cup, gave thanks, and gave it to them, and they all drank from it. 24He said to them, “This is my blood of the covenant, which will be shed for many. 25Amen, I say to you, I shall not drink again the fruit of the vine until the day when I drink it new in the kingdom of God.” 26Then, after singing a hymn, they went out to the Mount of Olives. If those words are familiar, it’s because we say them every time before the sacrifice of the mass in the Eucharistic feast! See, we too celebrate in this Eucharist. Now, a lot of saints have said a lot of beautiful things about the Eucharist. 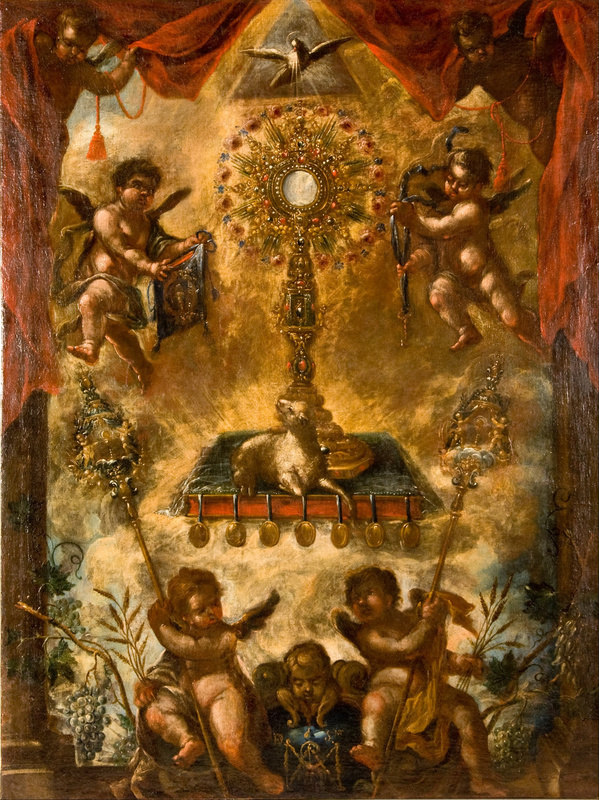 Allegory of the Eucharist, c. 1676-1725. Museo Cerralbo, Madrid, Spain. First of all! The Holy Trinity is shown here as a triangle, with the Holy Spirit, personified as a dove, coming out of it, to represent that the Holy Spirit is present in the tabernacle! 31You shall make a veil woven of violet, purple, and scarlet yarn, and of fine linen twined, with cherubim embroidered on it. 32It is to be hung on four gold-plated columns of acacia wood, which shall have gold hooks and shall rest on four silver pedestals. 33Hang the veil from clasps. The ark of the covenant you shall bring inside, behind this veil which divides the holy place from the holy of holies. 34Set the cover on the ark of the covenant in the holy of holies. 19Therefore, brothers, since through the blood of Jesus we have confidence of entrance into the sanctuary 20 by the new and living way he opened for us through the veil, that is, his flesh, 21 and since we have “a great priest over the house of God,” 22let us approach with a sincere heart and in absolute trust, with our hearts sprinkled clean from an evil conscience and our bodies washed in pure water. 11 From the rising of the sun to its setting,my name is great among the nations;Incense offerings are made to my name everywhere,and a pure offering;For my name is great among the nations,says the LORD of hosts. 8When he took it, the four living creatures and the twenty-four elders fell down before the Lamb. Each of the elders held a harp and gold bowls filled with incense, which are the prayers of the holy ones. And so, as we pray, we lift up incense as a reminder of the prayers of the saints, whom we believe share in the glory of the mass, as well as offer our own prayers. In this picture, you’ll see cherubim holding wheat and grapes below. This is a reference to this line! 18Melchizedek, king of Salem, brought out bread and wine. He was a priest of God Most High. Melchizedek is both king and high priest whom Abraham met! And then there is a prophecy in the Psalms that brings up Melchizedek again in Psalms 110! So, clearly he is a very important guy! Later in the New Testament, St. Paul reinforces Melchizedek’s role with a whole chapter in Hebrews 7! 1 This “Melchizedek, king of Salem and priest of God Most High,” “met Abraham as he returned from his defeat of the kings” and “blessed him.” 2 And Abraham apportioned to him “a tenth of everything.” His name first means righteous king, and he was also “king of Salem,” that is, king of peace. 3Without father, mother, or ancestry, without beginning of days or end of life, thus made to resemble the Son of God, he remains a priest forever.4 See how great he is to whom the patriarch “Abraham [indeed] gave a tenth” of his spoils. 5The descendants of Levi who receive the office of priesthood have a commandment according to the law to exact tithes from the people, that is, from their brothers, although they also have come from the loins of Abraham. 6But he who was not of their ancestry received tithes from Abraham and blessed him who had received the promises. 7Unquestionably, a lesser person is blessed by a greater. 8In the one case, mortal men receive tithes; in the other, a man of whom it is testified that he lives on. 9One might even say that Levi himself, who receives tithes, was tithed through Abraham, 10for he was still in his father’s loins when Melchizedek met him.11 If, then, perfection came through the levitical priesthood, on the basis of which the people received the law, what need would there still have been for another priest to arise according to the order of Melchizedek, and not reckoned according to the order of Aaron? 12When there is a change of priesthood, there is necessarily a change of law as well. 13Now he of whom these things are said belonged to a different tribe, of which no member ever officiated at the altar. 14It is clear that our Lord arose from Judah, and in regard to that tribe Moses said nothing about priests. 15 It is even more obvious if another priest is raised up after the likeness of Melchizedek, 16who has become so, not by a law expressed in a commandment concerning physical descent but by the power of a life that cannot be destroyed. 17For it is testified:“You are a priest foreveraccording to the order of Melchizedek.”18On the one hand, a former commandment is annulled because of its weakness and uselessness, 19for the law brought nothing to perfection; on the other hand, a better hope is introduced, through which we draw near to God. 20 And to the degree that this happened not without the taking of an oath—for others became priests without an oath, 21but he with an oath, through the one who said to him:“The Lord has sworn, and he will not repent:‘You are a priest forever’”—22 to that same degree has Jesus [also] become the guarantee of an [even] better covenant. 23Those priests were many because they were prevented by death from remaining in office, 24but he, because he remains forever, has a priesthood that does not pass away. 25 Therefore, he is always able to save those who approach God through him, since he lives forever to make intercession for them.26 It was fitting that we should have such a high priest: holy, innocent, undefiled, separated from sinners, higher than the heavens. 27He has no need, as did the high priests, to offer sacrifice day after day, first for his own sins and then for those of the people; he did that once for all when he offered himself. 28For the law appoints men subject to weakness to be high priests, but the word of the oath, which was taken after the law, appoints a son, who has been made perfect forever. 6Then I saw standing in the midst of the throne and the four living creatures and the elders a Lamb that seemed to have been slain. He had seven horns and seven eyes; these are the [seven] spirits of God sent out into the whole world. 7He came and received the scroll from the right hand of the one who sat on the throne. 8When he took it, the four living creatures and the twenty-four elders fell down before the Lamb. Each of the elders held a harp and gold bowls filled with incense, which are the prayers of the holy ones. 9They sang a new hymn:“Worthy are you to receive the scrolland to break open its seals,for you were slain and with your blood you purchased for Godthose from every tribe and tongue, people and nation.10You made them a kingdom and priests for our God,and they will reign on earth.”11I looked again and heard the voices of many angels who surrounded the throne and the living creatures and the elders. They were countless in number, 12and they cried out in a loud voice:“Worthy is the Lamb that was slainto receive power and riches, wisdom and strength,honor and glory and blessing.”13Then I heard every creature in heaven and on earth and under the earth and in the sea, everything in the universe, cry out:“To the one who sits on the throne and to the Lambbe blessing and honor, glory and might,forever and ever.”14The four living creatures answered, “Amen,” and the elders fell down and worshiped. Speaking of this bible passage… look at the picture again! The lamb is sitting on a book with seven seals. This is a representation of the scrolls with seven seals (referenced in this passage!) that the Lamb is able to open! And finally! Adorned in gold is the Host, the Holy of Holies! Its appearance is but a simple circular white wafer, and yet… in this simple wafer, God is present. Really and truly present. If that doesn’t astonish you, I don’t know what will! Here’s hoping you had a blessed feast day!